I am 65 years old. I am a director for a company my hubby of 47 years and I have run for 27 years. I live in Sussex and have 2 children, 5 grandsons, 1 grand-daughter, and 2 step-grand-daughters. What's your dieting experience to date? I have been overweight since having my first child at 18. My daughter was born three years later and by then I weighed over 13 st. I starved the weight off over many months, but it came back each time - plus more than ever. 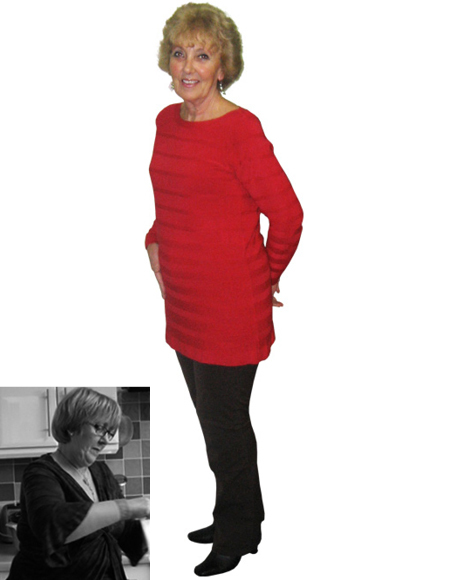 I have done most diets including Weight Watcher, Slimming World, Atkins and many more silly fad diets. They all worked at the time, but I just couldn't keep them up, so I gained all the weight and more back over the years. How has being overweight affected your life? Being overweight has stopped me from doing normal things like going out and making friends. I have never wanted to mix with people because I was fat and didn't want to be judged. Thankfully I have a wonderful family so have never been short of visitors. The past few years have been very difficult. I lost my Dad unexpectedly, then had a bad accident and spent three months in a wheelchair. Just as I was on the mend, my Mum died. I just ate and drank for months. I was looking through the photos when I saw my before picture - god was that really me? I cried buckets. I was having a hard time doing most things by then; just everyday jobs were an effort. What appealed to you about Nutracheck? I had always had a book and written down what I was eating when I was on my starvation diet, and I had heard of online diaries. I found Nutracheck by accident. I did the trial and I loved it, the forums were wonderful, full of other ladies and gents just like me. I have never looked back - I call NC my second home. I have no words that come close to saying how good I felt. I've had my lows since joining and gained a few pounds back, however I have returned to the forum and diary before too much damage has been done. How have your food choices changed now compared to before? Before I joined I was so greedy eating whole packets of digestive biscuits and junk food, as well as my normal 3 meals a day. I would eat 4 slices of toast with butter as a snack in the past! I have learned portion control now. I use my 1,400 calories like money. I spend it on much more sensible things like fruit, fresh vegetable and white meat and fish. I do sometimes have a biscuit but I know when to stop now. I love my porridge, fruit and salad now and I can have so much of it for such a small amount of my calories. Has there been a single thing that has really meant a lot to you? I have been fat for every wedding in my family and when Grandson number 1 announced he was getting married in September 2012, I set myself a goal to be a size 12. I bought a lovely navy and white suit and I reached my goal by the time it came around. The day arrived and at the church, my grandson got out of his car at the same time that I got out of mine, he looked at me and then he said "wow Nan you look gorgeous!" I have no words that come close to saying how good I felt. My lovely hubby tells me all the time how good I look as well which is just so good to hear, he must have got pretty fed up with my constant silly diets over the years! What has changed most in your life since losing weight? My life has changed because I have changed. I love to go out now with friends and family. I can't wait to go and buy new clothes - a thing I used to dread as nothing look nice on me. Most of all though I like me! I look in the mirror and I think YES not bad for an OAP. I know I will never gain the weight back - I will not go back to that horrible place that I have been in for so long. What are your top 3 tips for someone else who is still trying to lose weight? Try to be more active even if it is only for 30 minutes a day. Set yourself small manageable goals. If you have a bad day today, remember tomorrow is another day. Move on, don't beat yourself up - you are on a life time change not a race.